These easy Halloween shadow puppets are sure to please. They are a quick craft for kids of all ages, so let’s get started. These types of crafts are those we get the most ‘bang for our buck,’ so to speak. We had some stiffened black felt left over from our Olaf dress-up costume and we used those remnants for a set of Halloween shadow puppets. It was the witching hour and I needed something to get the kiddo to dinner without any fussing in between. 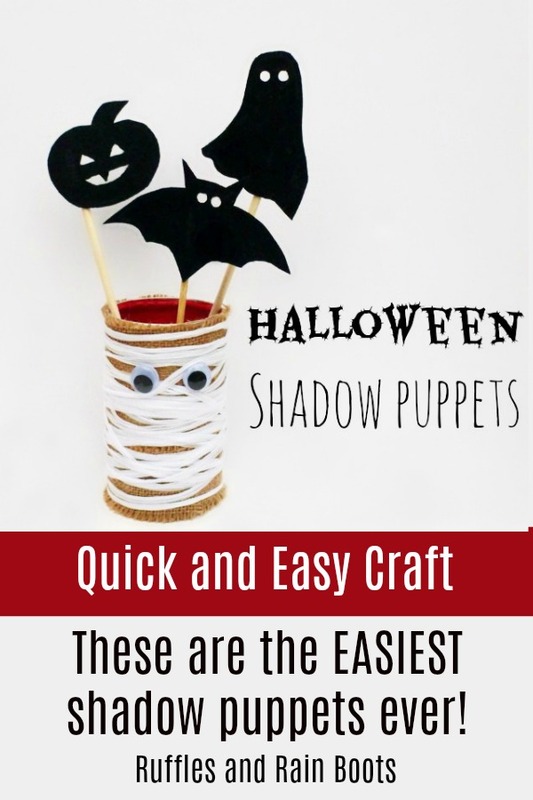 A quick, no mess craft like these Halloween shadow puppets was the answer. Elise would shout out something that was Halloween-like to her and I would draw it and get her approval before I cut it out of the felt. 1. A witch’s hat doesn’t look like a hat at all when cut from felt. 2. My daughter is quite picky about what a ghost should look like. I put together a quick printable of some of the puppets we created even though you most likely won’t need it. As you can guess, the instructions are ridiculously simple. Trace the shapes onto stiffened black felt using chalk and cut them out. I used a hole punch for the eyes. Using your choice of stick, tape the felt to the stick and enjoy! I had a small, empty meringue powder canister and used that as a holder for these puppets. I lined the top edge in the same red duct tape I used to adhere the felt to the chopsticks. I rifled around in my scraps and found three strips of burlap that fit around the tin, so those won and were Mod-Podged (can I use that as a verb?) to the canister. A few turns of white raffia ribbon and a pair of googly eyes made my mummy Halloween shadow puppets holder complete. These look cute and so much fun! Thanks so much! Our little one and her friends are still playing with these after a year. We put them into toy rotation and use them as story starters. It’s amazing how something so simple can be so lasting. Thanks for stopping by and I love your printables!! Wow, thank you so much Aimee! See you tomorrow! These are super cute! As a kid, I would have been enthralled by them! 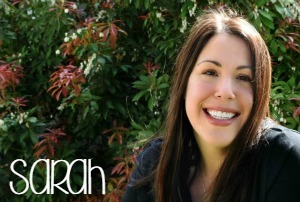 She really loves them, Sarah. They have been shadow puppets, tea party guests, FROZEN friends and so many more add-ons to her creative days. Thanks for stopping by! Thank you so much, Bre for the feature and for such a great party. Aww these are so cute! I Pinned it. Thanks so much, Melissa! Glad to have connected and I am now following! These are super fun! My kids will love them! Found you on the Flamingo Toes link up! Love the Flamingo Toes party, Kyla! Thanks for stopping by today and have a great time with the puppets – we sure are. These are really cute! I am going to show this to my eight year old daughter…for she would probably love to create something like this for her younger brother. Thanks for the idea! Oh, what a sweet girl to be thinking of her younger brother. You’re welcome for the idea, Kim, and thank you for stopping by today! Very cute! I have 2 2-years olds who will love these, my 6 year old will too :) Pinning! So glad you could find them useful, Joy and thank you for pinning! This is brilliant and easy and so dang cute! It seems like there is that hour in between diner and bedtime where you just plain need something to do. I have oodles of black felt in my craft cabinet and we are so making these tonight. Jen invites you to read Spooky Meal Ideas: Mummy Dogs! That witching hour can be brutal, Jen. I’m sure the kids will love it (and we love it because it gets the lights turned off and the mood calmed down a bit before bed). These could make great alternatives to sweets for trick or treaters. The look awesomely scary (no, not really)! We actually are still using these as shadow puppets which is nice, too. These are so cute! My boy LOVES shadow puppets! He’ll be super excited to see these! Right, Heather?! I didn’t know how well these were going to go over with her, but she is loving them. We’ve used them quite a few times before bed and it really helps to calm down at the end of a long day. I will be making some winter friends for her, I’m sure.